1) WSOH-8 is a Free Pro Football Contest with *membership options ($50 a season). *Note: You must be 21 years of age or older to win or claim a prize and you must of purchased your membership option before the start of Week 4 of the 2019 season to be eligible to win the grand prize of the Ring. However, players who purchase their membership after the completions of the Week 4 games, can still claim the weekly prize. 1st Place Winner: WSOH-8 Ring + Progressive Jackpot starting at $1000 in Cash! 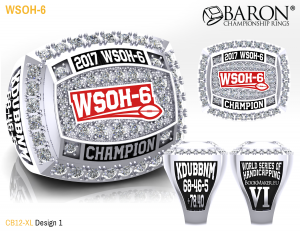 *Note: You must be a WSOH-8 member to be able to claim the 1st place prize of the Ring and Cash. a) Any *member who goes a perfect (7-0) during the week, will win $50 cash. In order to claim a prize, you must have been a paid member prior to winning and you must have a “PAYPAL” account. We will not mail or credit any credit cards. You must own a “PAYPAL” account, as all weekly winners will be paid out via PAYPAL. Example: if you go (7-0) in Week-1 or any week, but only bought your membership after you won, then you do not qualify for the weekly prize. You must be a WSOH member prior to winning. *Note: If there’s a push, and the contestants go 6-0-1, you will not get credited with a win and there’s no weekly winners in this case. In order to get the $50 payout, you need to go a PERFECT, 7-0! We will not award pushes or ties as wins. Maximum times you can claim the weekly prize is three (3) times. 2) All selections must be made via the WSOH website or WSOH app (Apple Store). No submissions will be accepted in any other format including email or phone calls to enter a users picks. No exceptions will be made. All picks must be entered via the WSOH website or app. 3) The contest will run each week during the regular season, players must make 7-picks each week. 4) Lines will be posted on Wednesday between 12:00pm EST and 3:00pm EST. The lines will not be adjusted according to live line moves. The Wednesday line posted will be the official contest line for that week. 5) A total of seven (7) picks must be made each week: any combination of sides and/or totals. 6) Selections must be submitted by 12:01PM (EST) EASTERN Standard Time on Sunday, if no Thursday games are being used as a selection. If a contestant is using a Thursday game as a selection then ALL selections for the week must be made before kickoff of the Thursday game. All picks will be available to the public on Sunday after the 12:01pm EST deadline. No Thursday picks will be displayed until after the deadline on Sunday, 12:01pm. 7) Selections may NOT be modified. Once a user submits their picks, they are official and they cannot be change. Therefore, make sure the picks you enter are the picks you can live with for the weekend. No changes can be made, once the system accepts your selections, they cannot be changed. 8) Picks must be ranked from 7.0 units (highest rated play) down to 1.0 unit (lowest rated play). Picks will be ranked from highest to lowest units (7, 6, 5, 4, 3, 2, and 1 unit). The contestant with the highest amount of “units won” at the end of the Regular Season (Week 17) will be declared the winner. Not the overall record or winning percentage. Tie Breaker #1: In case of a tie, the person with the most wins will be declared the winner. Tie Breaker #2: If players have the same amount of wins, then the players will go head to head in Round 1 of the playoffs using 3 picks, instead of 7 picks. The points system will be the same. 3 units, 2 units and 1 unit. Tie Breaker #3: If players are tied after the second tie breaker, then they will split the prize money. 10) There is NO bye weeks for selections. If a contestant does not make entries for a given week the record for the contestant that week will be (0-7) for -30.80 units. 11) Contestants’ selections will be displayed on the “World Series of Handicapping” contest website each Sunday at approximately 1PM (EST). 12) All decisions by the World Series of Handicapping staff are official, binding and final. 13) By registering and/or downloading the WSOH APP and entering this contest each contestant agrees to the rules of the contest. 14) Contest players are responsible for submitting their picks before the Sunday, 12:01pm (EST) Eastern Standard Time deadline. If you have a problem with your “make picks” process and the picks didn’t save or didn’t record properly, you MUST contact Ron Raymond IMMEDIATELY by email ( ronraymond@rogers.com) prior to the Sunday, 12:01PM EST deadline. As long as the picks are submitted before the cutoff time, they will be graded for that week, they might not be posted on the site immediately, but will be in the system. 15) Apple is Neither associated with Nor a sponsor of WSOH contest in any way.